You may remember, back in november, I talked to you about my haul on Style Korean (read more about it here) where I promised you a review. Well the time for this review has finally come ! 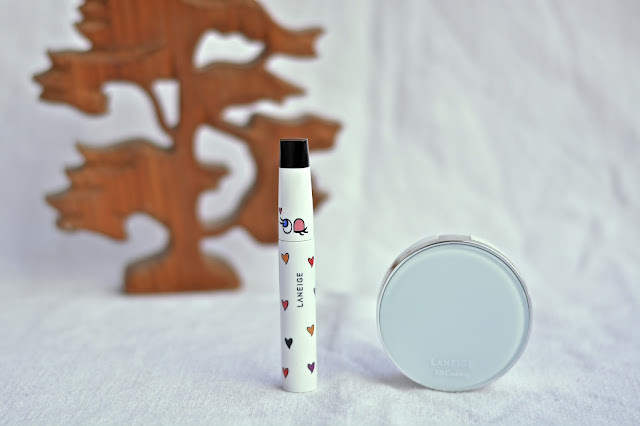 I ordered a BB cushion as well as a mascara from the prestigious korean brand Laneige. This is the first product I tried and it wasn’t long until I knew whether I liked it or not. Indeed, when it comes to mascara, I know exactly what I like and don’t like as well as what I want. I bought this mascara on a whim without looking it up at all and I knew that I could be disappointed. But I just couldn’t resist its cuuuute packaging ! Unfortunately, this is exactly what happened. This mascara, as the name would suggest, is supposed to curl your lashes. I couldn’t really judge on that because, if I’m unlucky enough to have very short lashes, I’m lucky enough to have them quite curled naturally, regardless of what mascara I’m wearing. But what I know for sure, is that it lacks volume and intensity. As you can see on the picture, the result after one coat, is very discreet. When you try and build it up, you can intensify it a little but you have to be very careful when doing so otherwise it clumps up very easily. 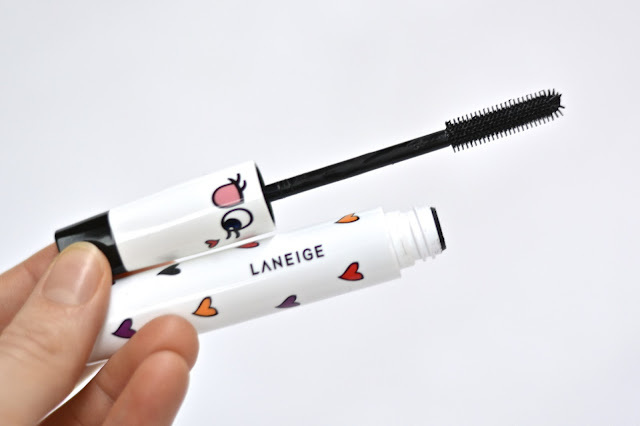 I would therefore say that this mascara is more suited for people looking for a very natural result, curly, defined, with just a hint of colour. The second product I tried out was this BB cushion. From what I know, it’s very popular in Korea (Asia ?) to have this kind of container for BB creams and they’re slowly making their way over here (Lancôme, Kiko and Physician’s formula have some for instance.) The way it works is that the product is inside the sponge that you can see in the compact on the picture above. 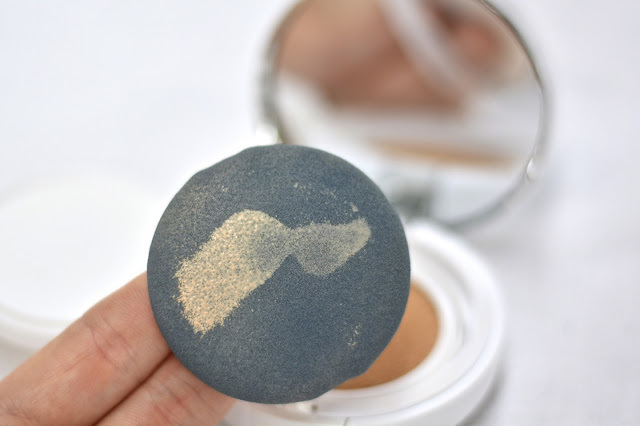 To get the product you simply push on the sponge with your fingers, brush, beauty blender or the flat little sponge that also comes inside the compact. I sometimes use my Beauty Blender to apply it because I like the finish on the skin better but I always feel a bit ridiculous taking makeup from a sponge with another sponge. So I’m not a big fan of the packaging, however, I must say that the product inside is really quite nice ! The shade I ordered is slightly too pale for me but if I blend it enough and apply a hint of bronzer it’s not a problem. As for the name, [pore controle] I must say that it doesn’t disappoint ! My pores around my nose and on my cheeks are quite visible and this BB cushion really helps to hide them. It doesn’t make them disappear completely obviously but it really helps. In terms of longevity, it isn’t the longest lasting foundation I’ve tried but it’s average when I compare it to my other skin bases. My face eats up my foundation anyway and I’m yet to find a foundation that will last all day on me. The finish isn’t mat, it’s more natural-dewy, this means that, with my oily skin, I have to powder it to mattify it a bit and set it. If I really want to focus on making my pores disappear, I will use my Etude House Dear Girls powder (which I talked about here), which combined with this cushion almost makes my pores disappear entirely ! 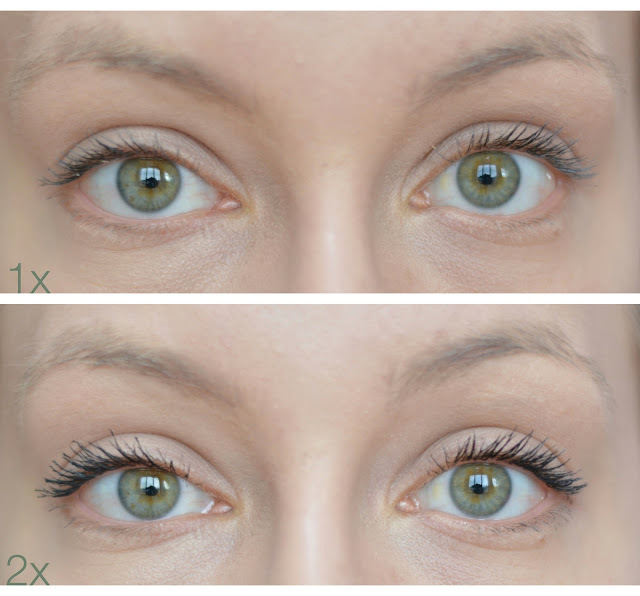 All in all, I wouldn’t repurchase the mascara because I like a much more intense look, but I would really recommend it to anyone looking for a very natural look as it separates the lashes nicely and adds a bit of colour. It lasts really well all day without smudging or flaking and isn’t a pain to remove. 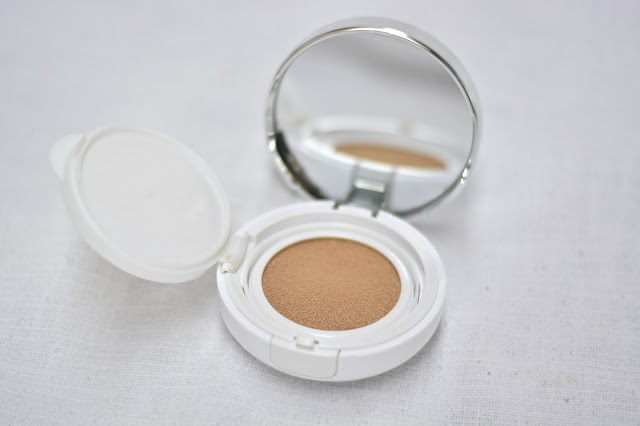 As for the BB cushion, it’s a really good light to medium coverage base. You can build it up a bit by layering it but you’ll never get a full coverage. Personally I really like it for more low-key days when I don’t mind that my skin doesn’t look absolutely perfect. It feels comfortable on the skin and doesn’t break me out (which happens quite a lot.) I’m not convinced that the cushion compact is any better than a tube but I don’t really mind it. All in all, it hasn’t rock my world so I probably won’t repurchase it but I will happily use it until the end. What do you think about BB cushions ?